Isaac Newton was born on 4 January 1643 in Woolsthorpe, Lincolnshire. His father was a prosperous farmer, who died three months before Newton was born. 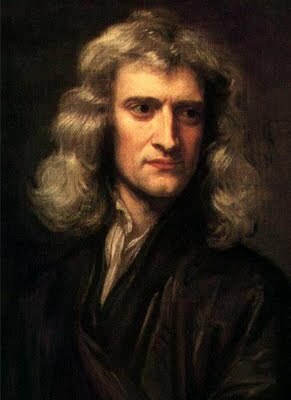 His mother remarried and Newton was left in the care of his grandparents. In 1661, he went to Cambridge University where he became interested in mathematics, optics, physics and astronomy. In October 1665, a plague epidemic forced the university to close and Newton returned to Woolsthorpe. The two years he spent there were an extremely fruitful time during which he began to think about gravity. He also devoted time to optics and mathematics, working out his ideas about 'fluxions' (calculus). In 1667, Newton returned to Cambridge, where he became a fellow of Trinity College. Two years later he was appointed second Lucasian professor of mathematics. It was Newton's reflecting telescope, made in 1668, that finally brought him to the attention of the scientific community and in 1672 he was made a fellow of the Royal Society. From the mid-1660s, Newton conducted a series of experiments on the composition of light, discovering that white light is composed of the same system of colours that can be seen in a rainbow and establishing the modern study of optics (or the behaviour of light). In 1704, Newton published 'The Opticks' which dealt with light and colour. He also studied and published works on history, theology and alchemy. In 1687, with the support of his friend the astronomer Edmond Halley, Newton published his single greatest work, the 'Philosophiae Naturalis Principia Mathematica' ('Mathematical Principles of Natural Philosophy'). This showed how a universal force, gravity, applied to all objects in all parts of the universe. In 1689, Newton was elected member of parliament for Cambridge University (1689 - 1690 and 1701 - 1702). In 1696,Newton was appointed warden of the Royal Mint, settling in London. He took his duties at the Mint very seriously and campaigned against corruption and inefficiency within the organisation. In 1703, he was elected president of the Royal Society, an office he held until his death. He was knighted in 1705. Newton was a difficult man, prone to depression and often involved in bitter arguments with other scientists, but by the early 1700s he was the dominant figure in British and European science. He died on 31 March 1727 and was buried in Westminster Abbey. Do you think its apple that led to the world's greatest discovery? If you do..then check this video. I'm just a simple guy who likes art in every form,and astronomy is my favorite.